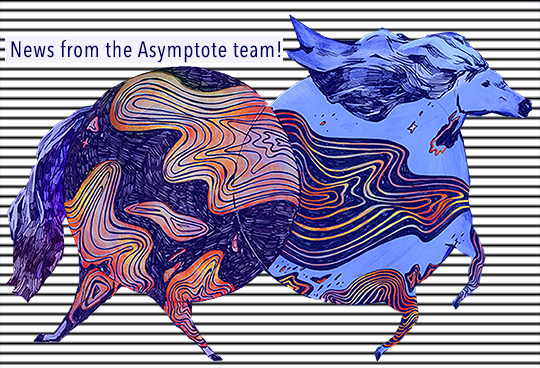 The Asymptote staff have been keeping busy! Fresh from working on the fabulous Summer 2018 issue of Asymptote, our team members have been busy with their own creative endeavors. Read on to find out what we have been writing, doing, and learning! Contributing Editor Aamer Hussein recently judged the McKitterick Prize. The prize, which honors the first novel by a writer over the age of forty, went to Nigerian writer Anietie Isong for his debut novel, Radio Sunrise. Communications Manager Alexander Dickow has had quite a summer: other than publishing poetry in Place de La Sorbonne, he also recently wrote for Paragraph and Plume (which also ran his translations of Max Jacob’s poetry). His work also appeared in La Revue des Sciences Humaines, Littérature, and larevue*.